Tips: To balance the richness of the sauce, serve this alongside a salad dressed with a light vinaigrette. You may substitute any seafood easily in this classic recipe. 1. Cook fettuccine according to directions on box. 2. Gently simmer stock over medium heat in a large heavy bottom sauce pot and stir in vodka and dill. Cook the sauce for 3-4 minutes. 3. 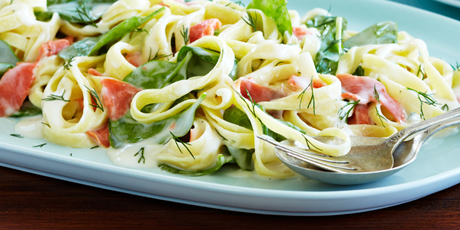 Add cooked, drained pasta, smoked salmon and spinach, gently stir to coat pasta. 4. Divide evenly on pasta plates or serve in warmed serving bowl.